The Point Lowly Peninsula is the only known place in the world where hundreds of thousands of Giant Australian Cuttlefish gather to breed. We need your help to urge the State Government of South Australia to protect this wildlife phenomenon from proposed industrial impacts. Commercially fished species also spawn in the region, which supports resident dolphin pods and receives seasonal visits from whales and occasional sealions and turtles. A desalination plant, iron ore export facility and fish farming have been variously proposed for the Point Lowly area, from Whyalla to Fitzgerald Bay. Should any of these proceed, water quality and habitat values in this sensitive ecosystem will be compromised. Scientific studies have shown that changes in salinity, pH, toxins and acoustic trauma can harm or kill cuttlefish and their eggs. 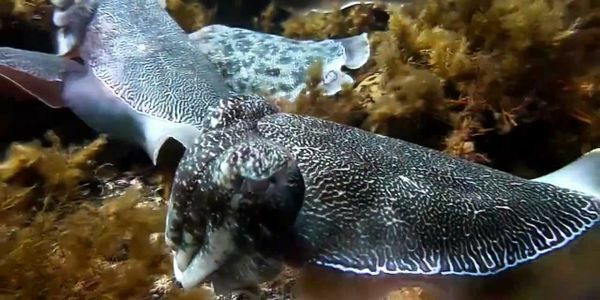 The Giant Australian Cuttlefish and Upper Spencer Gulf fish nurseries need your help. Sign and share our petition and urge our State Premier to insist on relocating proposed industrial developments to less sensitive areas. We the undersigned urge the South Australian Government to insist on the relocation of the proposed BHP Billiton desalination plant, Port Bonython iron ore jetty and future fish farming away from upper Spencer Gulf. We believe that such measures are necessary to protect the Giant Australian Cuttlefish breeding grounds and vulnerable fish nurseries of the region. The health of this ecosystem provides fish stock for South Australian fisheries and attractions for burgeoning ecotourism in the area. It has been referred to as our 'marine Arkaroola' and needs your help. In 2013, the cuttlefish breeding population in upper Spencer Gulf reached a record low. Investigations of the decline have not adequately assessed industrial pollution. The proposed desalination plant, port and potential return of fish farming to the area threaten to impede the population's recovery. Any desalination plant's operation will release salty brine into this sensitive ecosystem. Scientific studies have shown that increased salinity kills cuttlefish and squid eggs. It could also harm the early life stages of other fish which spawn in the area, including snapper, western king prawns, squid, eagle rays and Port Jackson sharks. The upper Spencer Gulf also supports local dolphin pods and visiting whales. Increasing industrial activity in this Marine Park will increase stresses on the environment via nutrient enrichment from fish farming, and spills and underwater noise pollution from shipping. We do not believe that the wider economic, environmental and social costs of such allowances have been considered with due care. The Point Lowly area was zoned for industry during a desperate economic time for Whyalla. It was also a time when the surrounding marine environment's importance was vastly undervalued. Time has shown us that where industry operates, accidents happen and environments are impacted. The establishment of the Upper Spencer Gulf Marine Park in 2009 was a step in the right direction, but it fails to adequately manage industrial pollution. Jay, the Giant Australian Cuttlefish and Upper Spencer Gulf fish nurseries need your help. We urge you to insist in a precautionary approach to industrial development so that the giant Australian cuttlefish population and the environmental health of the region can be maintained or improved.